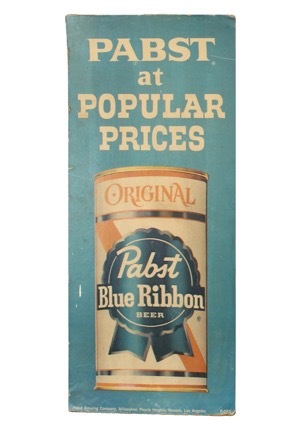 Three large cardboard Pabst Blue ribbon advertisement pieces. One measures at approximately 34x39” and reads “The YANKS ARE COMING Follow The Yankees on Channel 11” with a Pabst Blue Ribbon below. 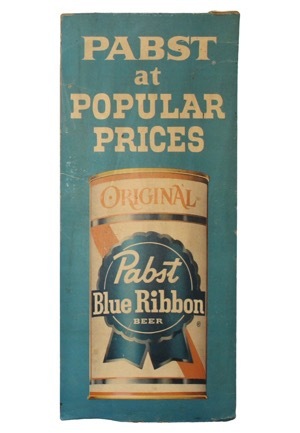 The other two are identical and measure approximately 16x39” and read “PABST at POPULAR PRICES” with a Pabsts can and logo before. 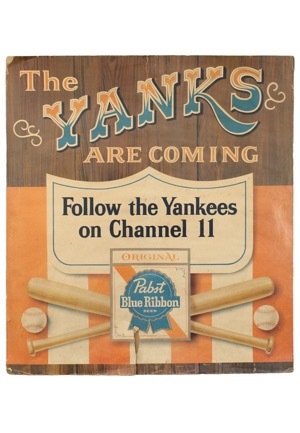 There is obvious condition issues with a slight tear in the larger piece and all pieces have experienced paper loss and bending, creasing and fraying issues on the corners and backs.